Already in early times naturalists gathered in associations and societies to encounter fellows, share discoveries, publish research and why not - have a good time. In the 17th century the members of the Royal Society not only enjoyed a good coffee, but organized also every week lectures and public experiments to promote science. The first Geological Society was founded 1807 in London, followed in 1830 by Paris, in 1836 by Tyrol and in 1848 by Berlin. Ironically if the request by the Tyrolean Alois Pfaundler in 1803 for the "Mineralogisch-geognostischen Vereins in Tirol (Mineralogical-Geognostic Society of Tyrol)" had been accepted, maybe the first in the list would be the small Austrian province and surrounding areas - known already for its peculiar minerals. The Geological Society in London was a privately founded organization, first intended more as a small and elitist dining club for amateurs interested in geology. However already a year later the number of members had increased drastically, the society begun to organize a collection of paleontological and geological specimens and possessed a fast growing library. Fig.1. 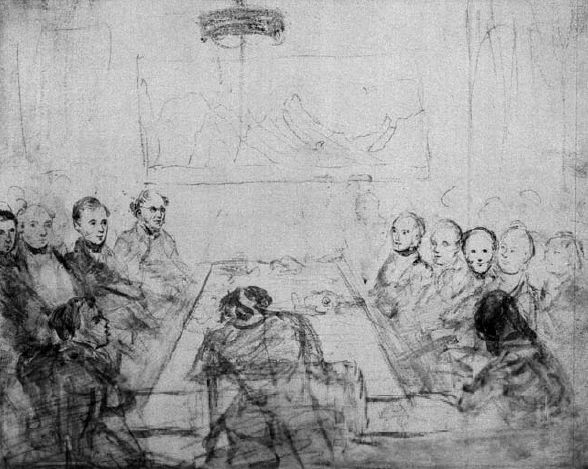 The Geological Society in session in the first Somerset House meeting room with its "parliamentary" layout, ca. 1830, sketch by Henry De La Beche. But the Geological Society did not yet possess an official recognition and Royal Charter. The society was not considered a legal institution, it could therefore not rent rooms for meetings and most concerning it was not considered owner of the great collection of books, fossils, rocks and minerals donated by the single members. The official recognition by the monarchy was also an ambitious target to increase the prestige of both the society and the single members and the still young science of geology. Especially the conservative Rev. William Buckland, elected in 1824 as President of the Geological Society, was very ardent to achieve this prestige. "fifteen years have passed since I was placed, by your kindness, in the honourable position of filling this chair, at that important period in our history when we received the national recognition of a Royal Charter. I shall never cease to consider it one of the brightest rewards of my labours in geology [. . .]"
To gain the Royal Charter was not an easy task; it needed the support and connections to influential politicians, had to deal with possible opponents within and outside the society (especially the Royal Society considered the Geological Society a dangerous competition) and was an extraordinary financial burden for a such a society - only to submit a formal petition 300 pounds were needed, half the financial capital of the society. Despite the emerging problems of rivalry and financial burden, in 1824 the society decided to prepare the petition and handle the draft to the authorities. April 23, 1825, the King approved and sealed with the Great Seal a Royal Charter creating the Geological Society of London as a Corporation. With the recognition of the society also the possibility of free accommodation in a public building - Somerset House - was possible and soon the society settled in the eastern wing of the new building. With the benefit of one financial problem gone - to pay for room - the members continued their work to organize the new society. 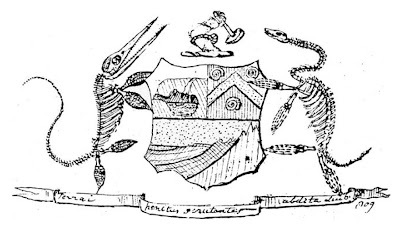 In a letter of the June 13, 1825 Henry De La Beche, noted geological caricaturist, offered a sketch for a proposed Coat of Arms for the new Society. Fig.2. Henry De La Beche's proposal for a coat of arms for the Geological Society, 13 June 1825. 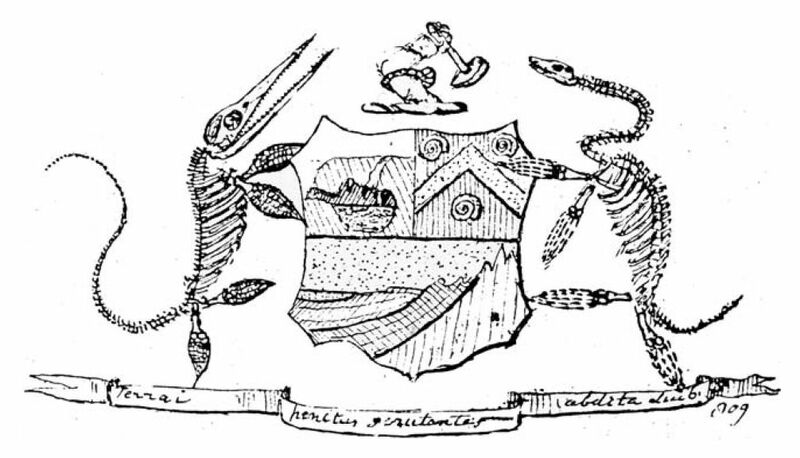 De La Beche proposed that the coat of arms should include in the main shield a simplified section through a bone cave, apparently based on one of the plates in Buckland's Reliquiae Diluvianae (1823). The other upper quarter would have included three ammonites, beneath would be a geological section of the northern flanks of the Alps. Rampant skeletons of an ichthyosaur (on the left) and a plesiosaur (on the right) would serve as heraldic supporters of the shield. De La Beche proposed that the crest above the shield should be the commonly found heraldic device of the bras arme´ - an arm wielding a weapon, although in this case the "weapon" would be a more inoffensive geological hammer. But the idea with the coat of arms was not followed and finally (in 2007) replaced by a Geological Society logo used by William Phillips in 1811 on the original copy of the Society's Transactions. Coat of arms with geological content can be still found, the English city of Whitby adopted three snake-stones (ammonites), and the Czech Republic is very proud of its fossils and role in the history of geology. The city of Skryje for example has in it civic heraldry even a trilobite, inspired by the species Skreiaspis spinosus (thanks to Dr. Astudillo-Pombo for the information). And Georneys presents the Dartmouth's Department of Earth Science logo (with typo). I'm a big fan of your blog and came across this old post. Years ago I remember reading in some history (of the British Survey?) of another alternate coat of arms. What I remember is that it was drawn by a daughter of one of the principle members, and featured a mole or badger or some digging animal with the words "We Bore". Have you ever come across this? Since 2009, I managed to locate and document more than 50 civic European coats of arms, alluding to the fossil record of the municipality. All these coats of arms appear figurated and described in my blog GLOSSOPETRAE (http://glossopetrae.blogspot.com.es/), under the label "paleontological heraldry"